Bellamy’s Limited Australia is a major Australian food and beverage company, and is the parent company of Bellamy’s Organic, Australia’s largest organic infant formula producer. It is also one of the stocks that Pythagoras provides mathematical recommendations for. 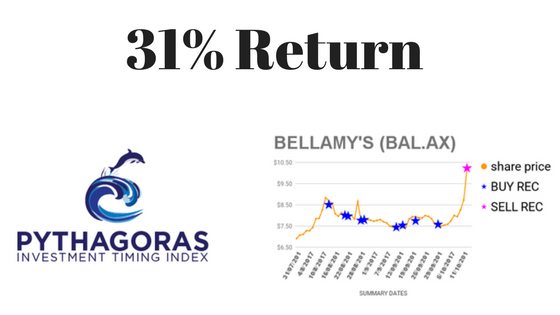 Investors who chose to subscribe to Pythagoras recommendations for Bellamy’s Limited have been handsomely rewarded with a 31% return in under 60 days. 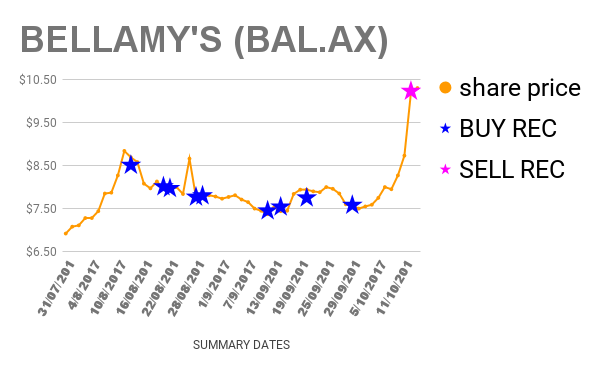 Although the price moved 20% over the same period its important to understand that we bought 9 times during those 2 months. 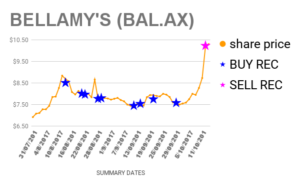 Each buy returned between 20.2% and 35.7%. If you only bought 1 share each time you would have made $21.69 in profit!! Our predictive technology takes a complex snapshot of each stocks historic performance and measures volatility, allowing us to predict events that will affect the stock price. There are a multitude of events which affect share prices of stocks every day. ← Bitcoin – will you still be there when it all goes bang?